The Neil's Cottage was introduced in 2016 and features Belleek's hand painted shamrocks. 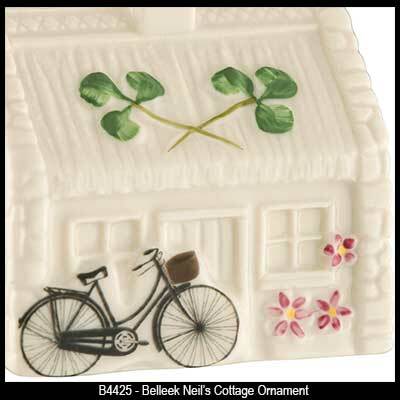 The Nell's Cottage from Belleek China represents a typical Irish cottage. This Irish bell ornament features Belleek's hand painted shamrocks along with fine china craftsmanship and measures 2.1" long x 1.75" wide x 2.1" tall; it is ready to hang on your Christmas tree with the included gold tassel. 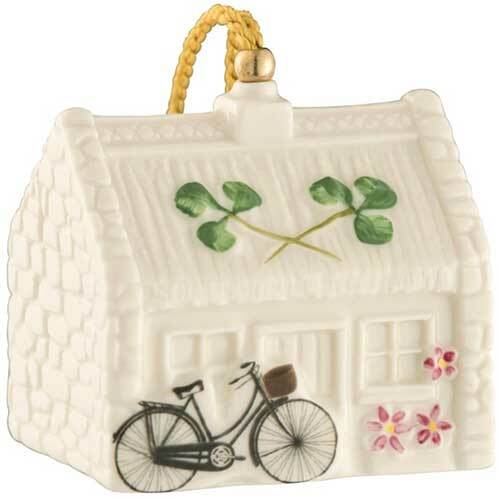 The Irish Christmas ornament is hand crafted and hand painted in Belleek, Ireland and it is gift boxed with a shamrock history card, complements of The Irish Gift House.